Make it easy for students to follow the writing process! 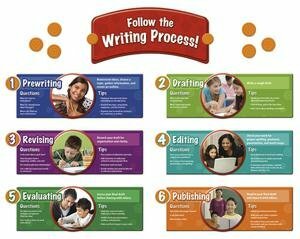 This easy-to-read, step-by-step classroom reference provides definitions, tips, and questions for each step: Prewriting, Drafting, Revising, Editing, Evaluating, and Publishing. A teacher's guide with reproducibles offers activity ideas to extend learning. Set of 19 pieces. If you have any questions about this product by Edupress, contact us by completing and submitting the form below. If you are looking for a specif part number, please include it with your message.